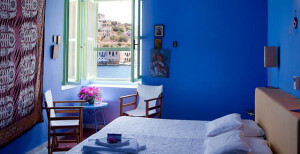 You don’t need much to be happy on Kastelorizo, especially when you stay at Hotel Mediterraneo. 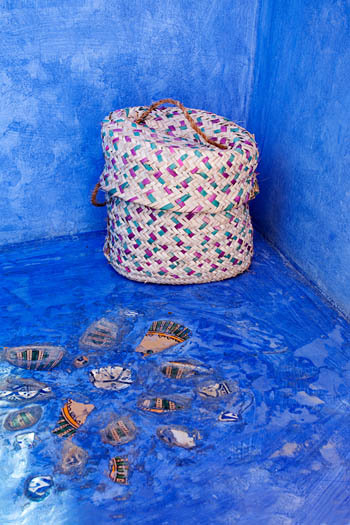 Take with you some good books, decent walking shoes (the island is best explored on foot) and plenty of sunscreen. And then go with the flow. Everything about this little island just off the Turkish coast is quiet and peaceful: people are friendly; the atmosphere is magical. 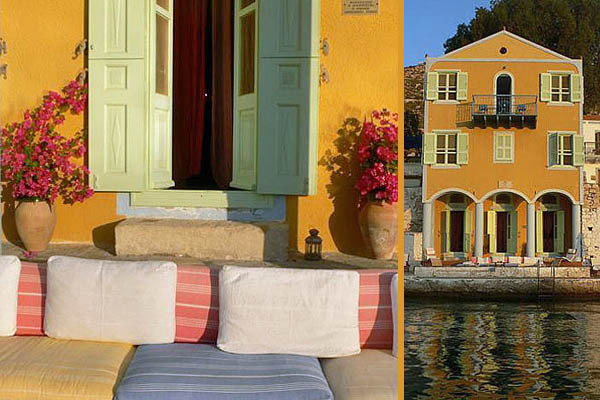 Kastelorizo made Parisian architect Marie Rivalant fall in love three times: first with the island itself, then with a man living there and finally with an old, waterfront house. So she moved to the island, married the man, and bought the house. 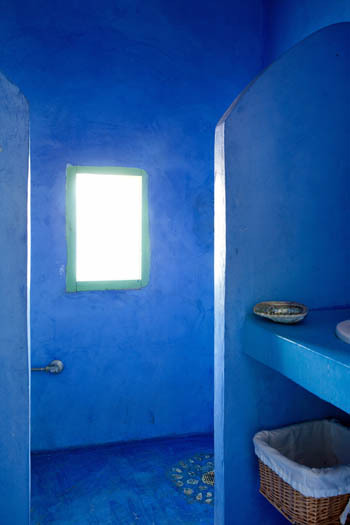 Luckily for us, she decided to turn the house into a little hotel, and did so without trying to make an architectural or design statement. 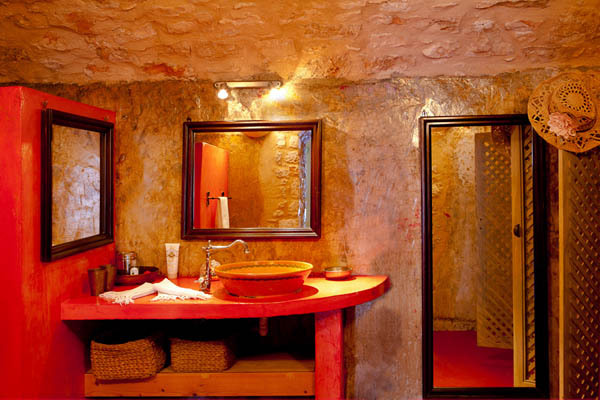 The house was charming enough as it was, and Marie wisely kept it that way, adding just colour, arty bathrooms and oriental details, all giving it a touch of the exotic. 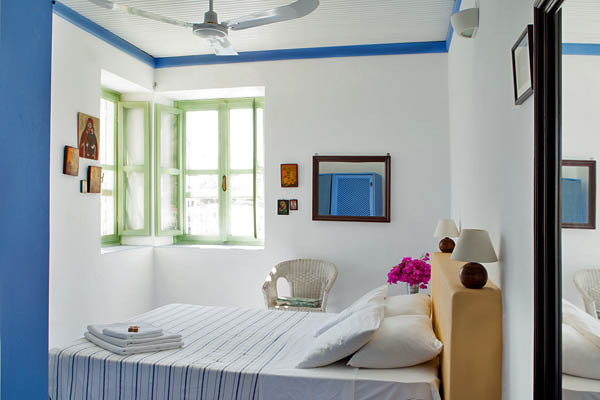 Bedrooms are spread over two floors, several light and airy ones facing the sea, and others that have a more oriental feel, with mattresses on a sleeping platform. 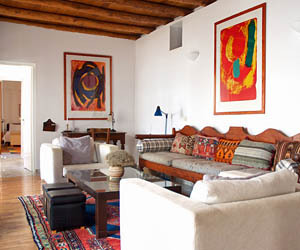 A magnificent suite occupies the ground floor. 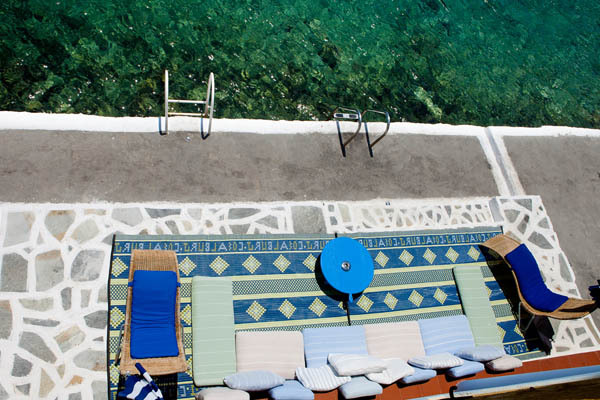 Breakfast, a blend of Greek, French and Turkish delicacies, is served on the terrace, and during the day you can sunbathe in front of the house and dip into the clear waters. 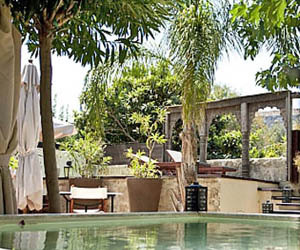 I love the simple, unpretentious atmosphere of hotel Mediterraneo and the waterfront location is great; it basically feels like having an immense pool at your doorstep. You can swim across the bay to have a drink at the little bar (the hotspot on the island) right across. Don't expect luxury. 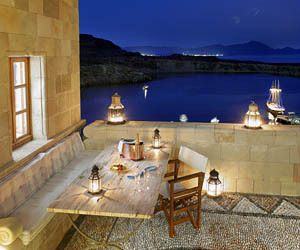 I was perfectly comfortable, but if you prefer luxury hotels you may find the comfort too basic. Minor detail: bathrooms don't have doors, but curtains for privacy. The sound insulation between the interconnecting rooms is not optimal. 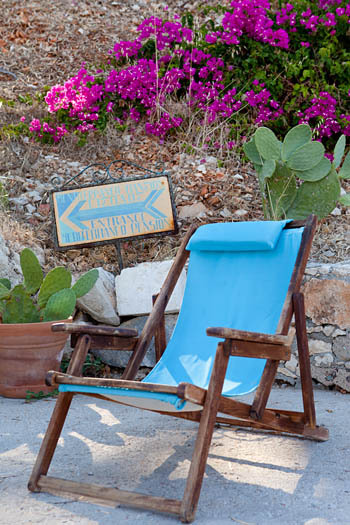 The 'street' is your beach! 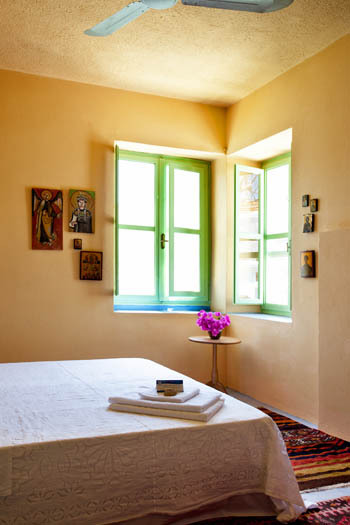 Prices for two persons from 70 Euro per night, breakfast and taxes included. 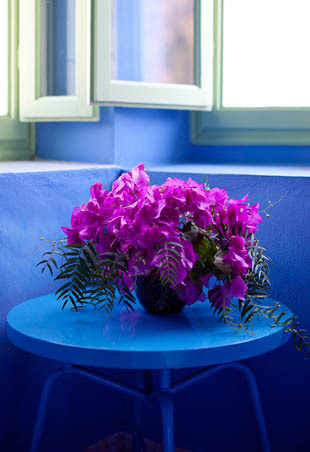 For a full overview of room rates, please check the website of hotel Mediterraneo or contact Marie. 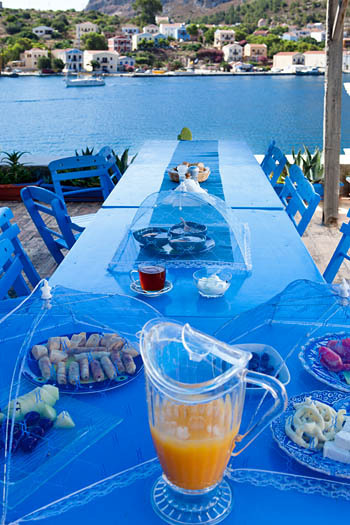 For lunch and dinner you have plenty of choice on Kastelorizo. I must say I generally ate very well on the island. 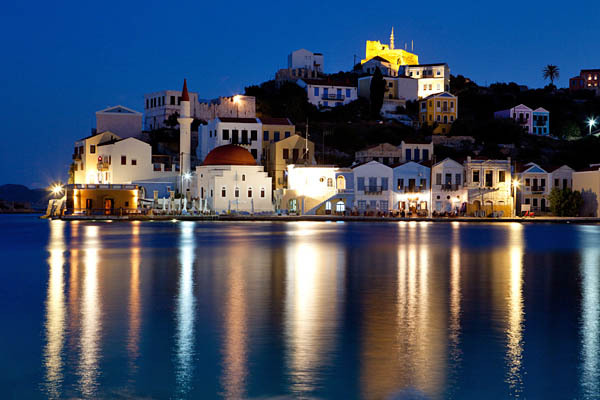 There are lots of cute little restaurants and tavernas by the water, and I liked all the ones I tried. My best meal, however, was on the hill on the other side of the bay, at the little square next to the church. Ask Marie for some recommendations as well. 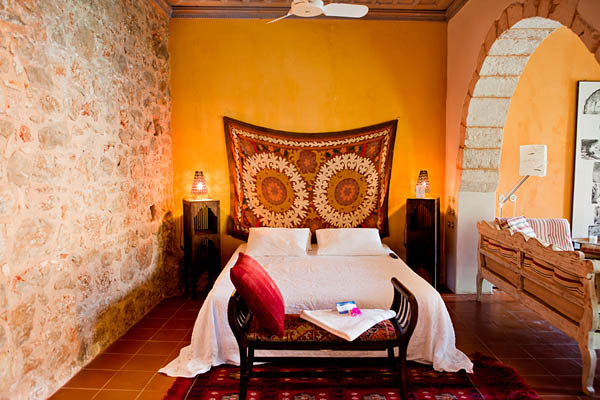 We stayed here with our children in two interconnecting rooms and we all had a great time. 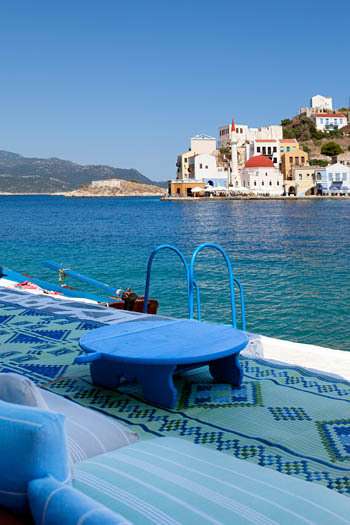 The kids loved their room with two single mattresses placed on a sleeping platform, and they really enjoyed the easy-going atmosphere on the island, the boat trip we made, the swims in the sea, everything. 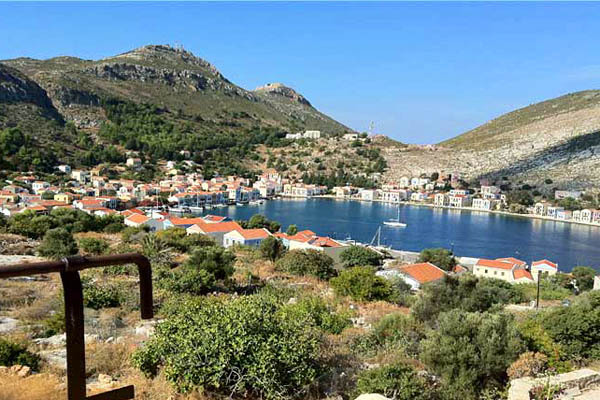 So, I think this is a great place to go to for simple, peaceful family holidays, but nevertheless, as there are no beaches I don’t recommend Kastolorizo for vacations with very young children. If you stay in Mediterraneo with toddlers, you would really have to supervise them at all times, as the sea is right in front of the hotel. 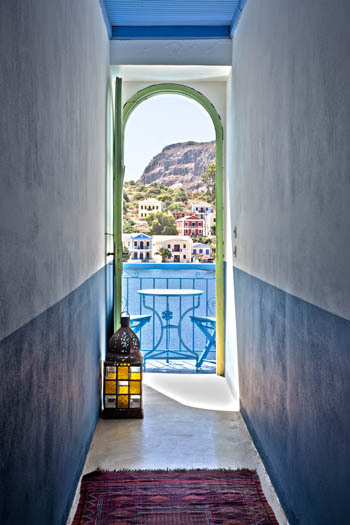 Hotel Mediterraneo is in a quiet spot just metres from the water in the horseshoe shaped bay of Kastellorizo, right where the Oscar-winning movie Mediterraneo was shot. 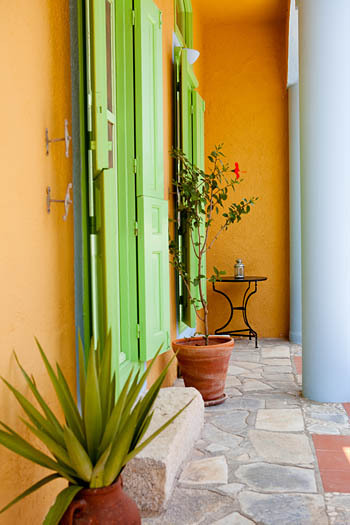 Small shops, cafés and tavernas are all a short stroll away. 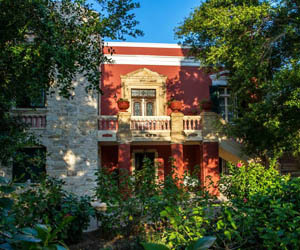 Unless you come from Kaş in Turkey, you first have to get to Rhodes, which can be reached by ferryboat from Piraeus (overnight ferries take about 12 hours), from other islands (Crete, Kos, Santorini, Paros and others) and also from Marmaras in Turkey (one hour away), or by plane – the airport is served by an array of domestic and international airlines. 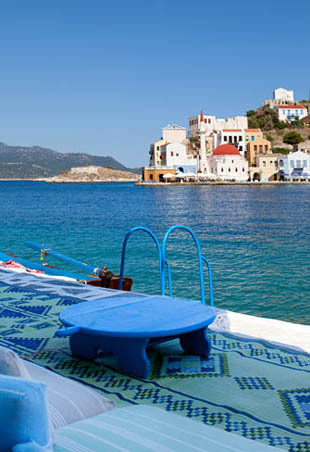 From Rhodes you can take either a connecting flight to Kastelorizo, or a ferry (about 4,5 hours). Connections are not daily so be sure to be well informed before you make your bookings. 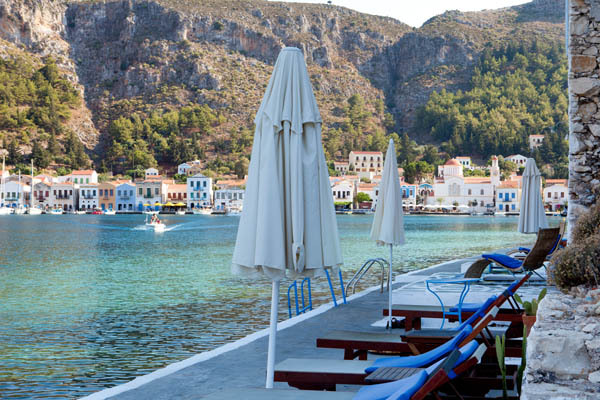 Once you arrive on the island getting to the hotel is easy. 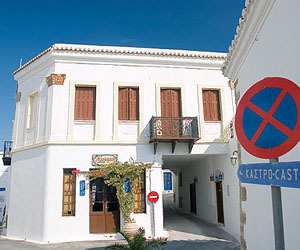 You can take a taxi or the municipal mini-bus from the airport to the ‘town’. 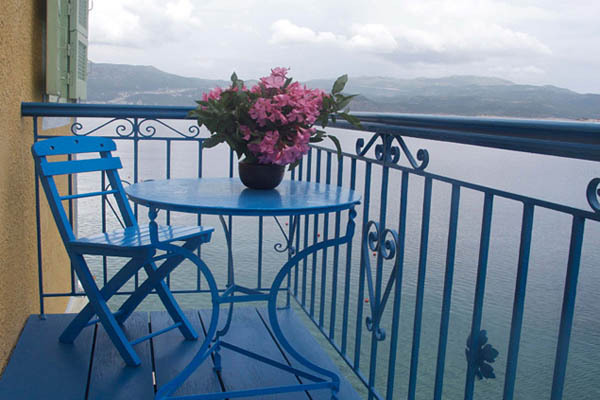 Facing the sea, you go left and follow the waterfront to the end of the bay where you will see Hotel Mediterraneo. 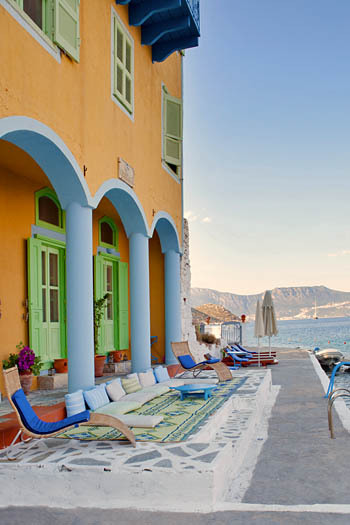 We stayed in the hotel mediterraneo on Kastellorizo this October, this is a wonderful, special place. We found it with the help of your website, thank you for that. 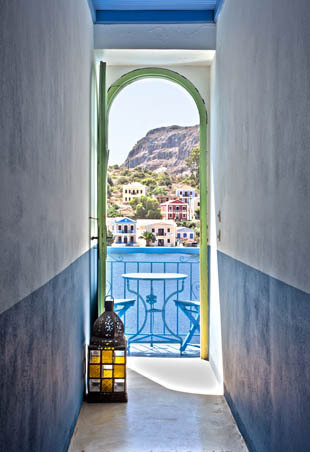 We are old Greek travellers, and love those places, which are individual and not “mass Tourism”. 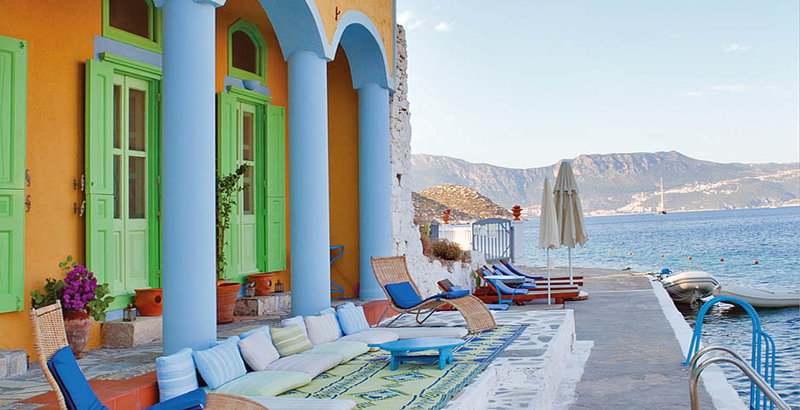 We are sure try more of your hotels. 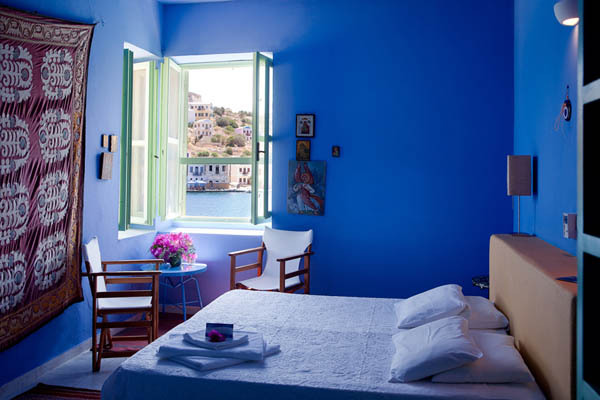 We stayed with Marie in Kastelorizo on honeymoon last summer, and totally concur with what a fabulous place it is. 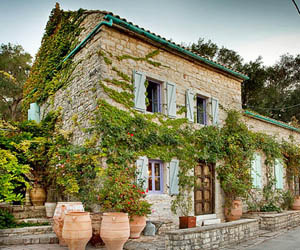 We loved Marie, her husband Yiorgos, and Costas. So many wonderful people, we have promised to routinely return to celebrate our marriage.